GRAND RAPIDS, Mich. and SUZHOU, China, April 10, 2018 /PRNewswire/ — Olivera�? 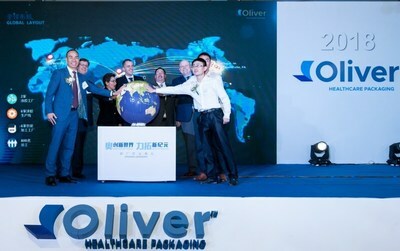 Healthcare Packaging, a leading provider of sterile barrier flexible packaging for the global healthcare industry, today announced the opening of a new 68,000 square-foot manufacturing facility in Suzhou, P.R. China. In this facility, all manufacturing will occur within an ISO-7 certified clean room environment, and product capabilities include pouch making, roll stock converting (including slitting and printing), die-cut lid manufacturing, and mounting card production. CEO of Olivera�? Products Company, Mike Benevento, had this to say, "On behalf of the global team at Oliver, we are thrilled to open our new facility in Suzhou. Our customer base has grown significantly in the Asia Pacific market, and we are doing all we can to help drive and support their success, including opening this facility in addition to a regional office in Singapore. It’s important to me that every Oliver customer, regardless of their location, experiences the same level of technical support and customer service. Investments like these are critical to delivering what our customers need from a global supplier." Olivera�? Healthcare Packaging is a leading supplier of pouches, lidding, roll stock, and mounting cards for the global healthcare industry. Our packaging protects medical devices and pharmaceutical products throughout the sterilization, shipment, and storage processes. We offer an extensive portfolio, including specialty products designed to solve tough packaging issues like the award-winning Dispos-a-vent® pouch. In addition, Xhale® and SealScience® adhesives allow for increased productivity, better evidence of seal integrity, and ease of aseptic presentation for improved patient safety. Headquartered in Grand Rapids, MI (USA) and with manufacturing around the globe, Oliver is ISO 13485 certified. Visit us at www.oliverhcp.com.